ELECTRA GREEN MOTOR STOPPED WORKING ON 05/03/2010. WE NEED YOUR HELP TO GET A REPLACMENT MOTOR. ELECTRA GREEN AND US GAVE TO THE COMMUNITY WITH OUT ASKING FOR ANYTHING. WE JUST CAN'T BUY A NEW ELECTRIC MOTOR AT THIS TIME. WE CAN'T DISPLAY ELECTRA GREEN WITH OUT A MOTOR. ELECTRA GREEN IS OUT OF SERVICE UNTIL IT IS REPAIRED. WE DID OUR BEST TO HELP SUPPORT THE COMMUNITY NOW WE NEED HELP. On 05/10/2010 I was able to get the motor to run again but the motor is now under 2 hp. I still need help getting a motor. On 05/14/2010 I got some good news from a supporter and also from the good guys from EV Drives. ELECTRA GREEN IS GETTING A NEW MOTOR. MANY THINKS TO THIS SUPPORTER. 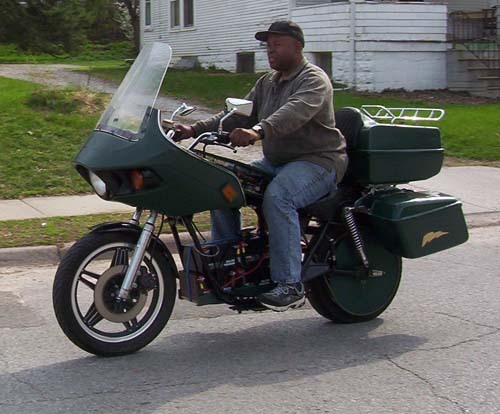 I started this electric bike project to work with alternative power sources. 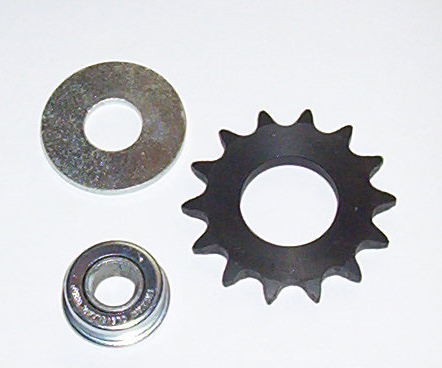 As you can see I am using a 120 tooth sprocket for the drive wheel. 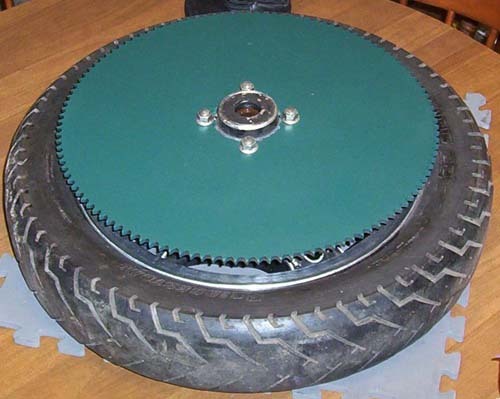 Our sprocket mounted to the drive wheel. Our drive wheel mounted to the bike. 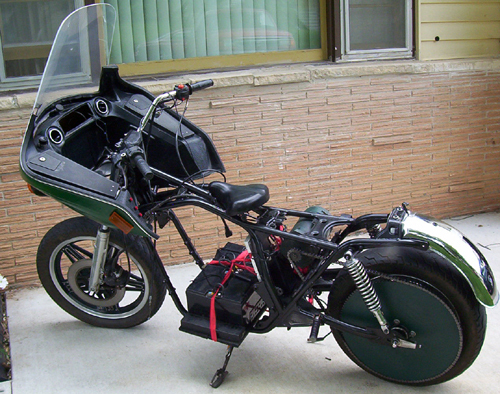 Power for our electric bike can be as high as 20hp. 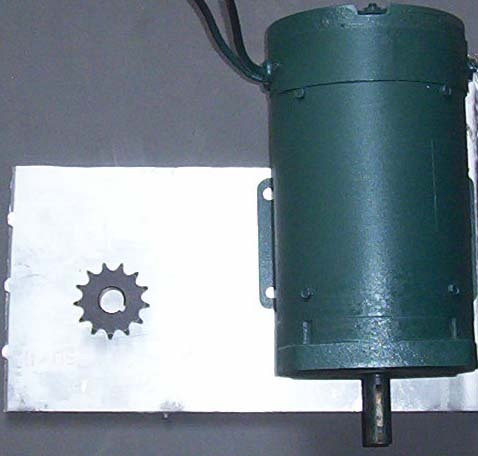 We are using a 2.5kw dc motor at this time. 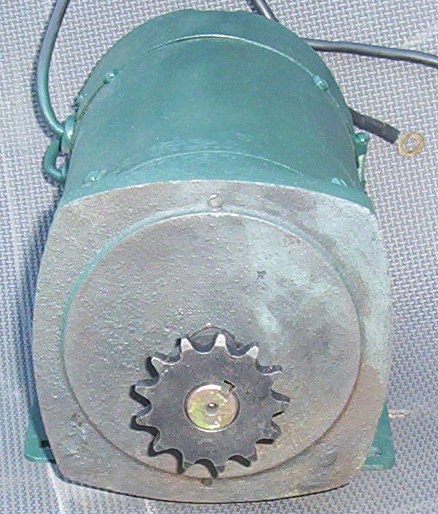 2.5kw motors can put out over 5hp. 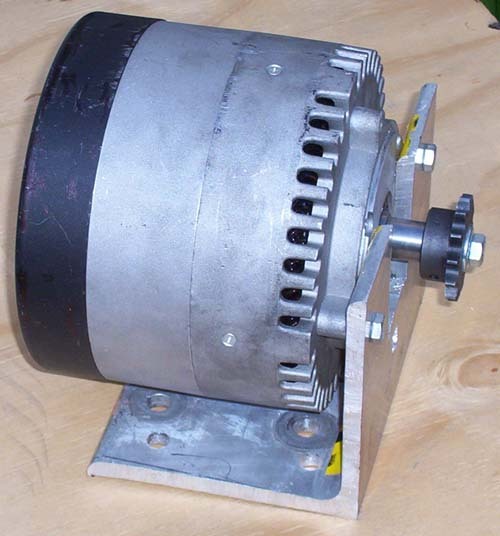 One thing about a DC motor is it will give full power at low rpm. We are using a 13 tooth on the motor and 120 tooth on the drive wheel for climbing hills and to save on battery power. 13 tooth sproket mounted to motor. This is our replacment motor, thanks to our sponsor and EV Drives. We are using the Mars 709 motor . Go to www.EVDRIVES,COM to learn about this fantastic motor. Hats off to EV Drive for helping us get this powerhouse of a motor. 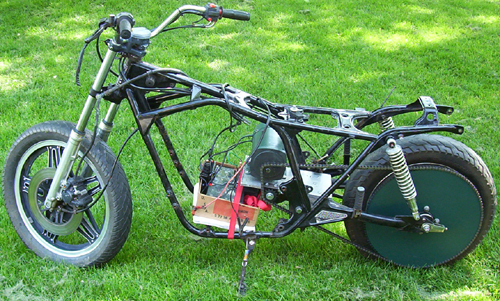 2.5kw 48v Motor mounted to bike. 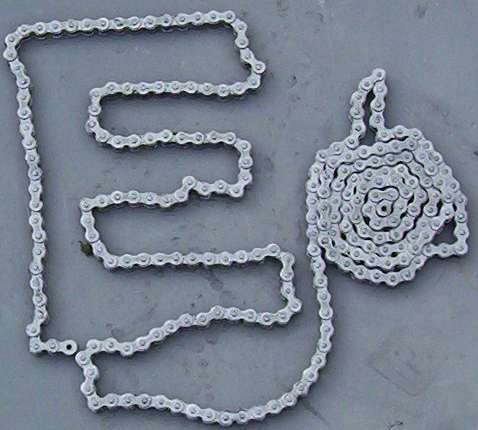 The nunber 40 chain is very strong and and a affordable. 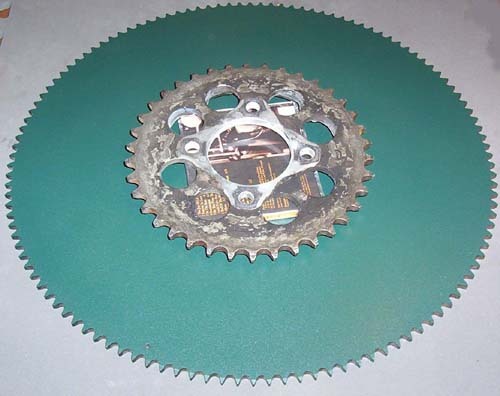 Idler sprocket ready to be installed on bike. 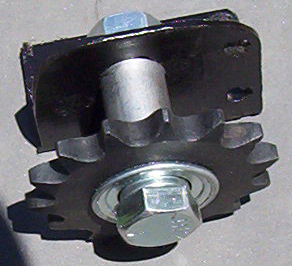 Idler sprocket and chain mounted on bike. We had to take the bike out for her maiden voyage. I installed 3 12v batteries a controller and a 5k pot. We had no seat or brakes and this bike took off like a bat out of hell. Please don't do what we did. It was a fun , sore and dangerous test run. 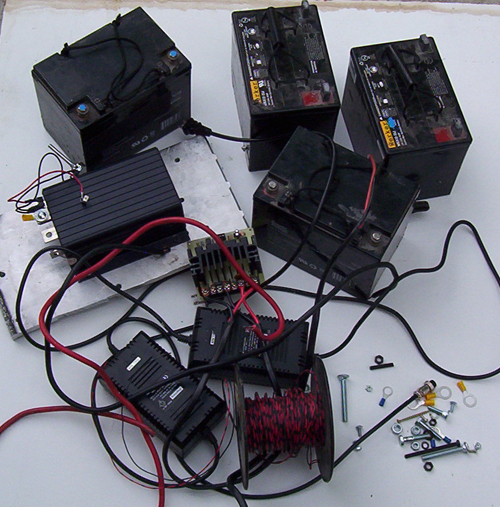 To make room for larger batteries we relocated motor and eliminate the ilder gear. 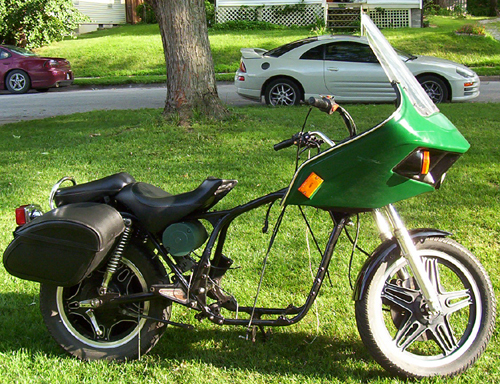 With a name like Electra Green We had to add green to the bike. 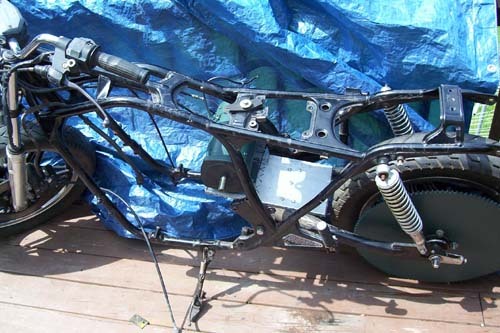 Now it is time to wire the light and electronics on this bike. Like a wizard we mix and match the right amount of electronics and wires. 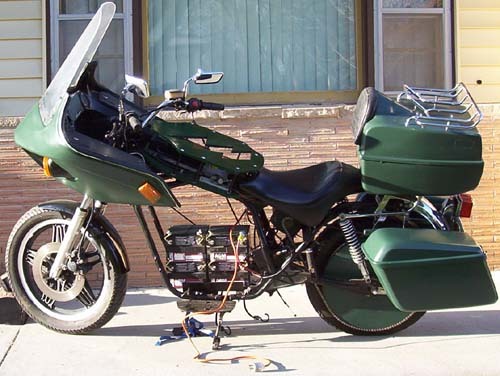 Now the magic of electronics bring power to the bike. 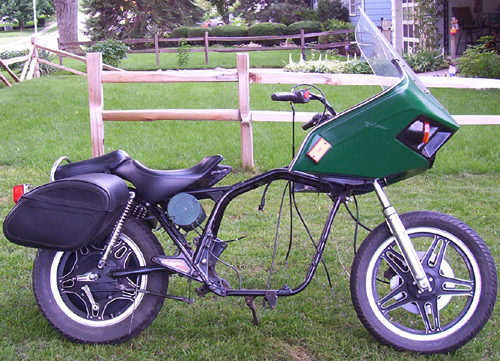 Side view of the bike . 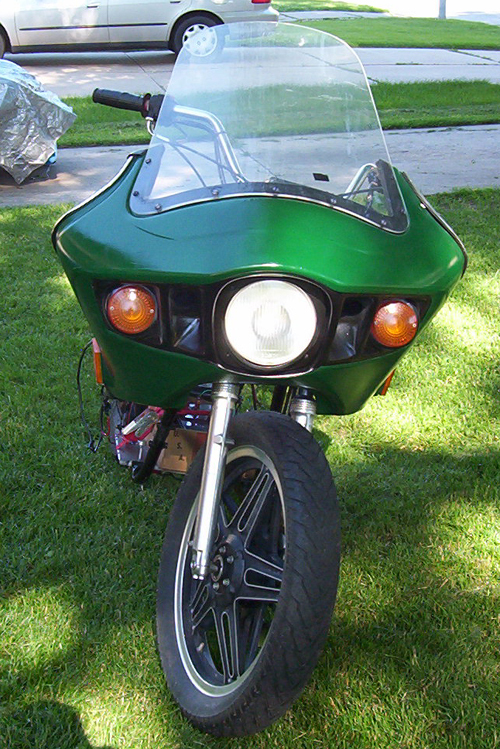 Front view of the bike . 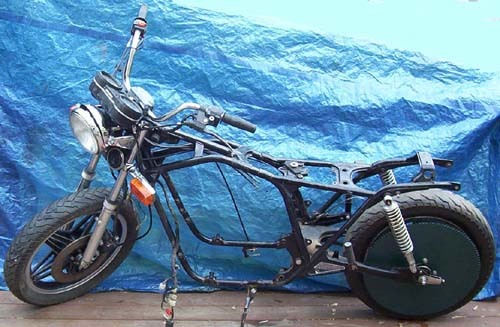 Our next step is to cover and dress this bike. 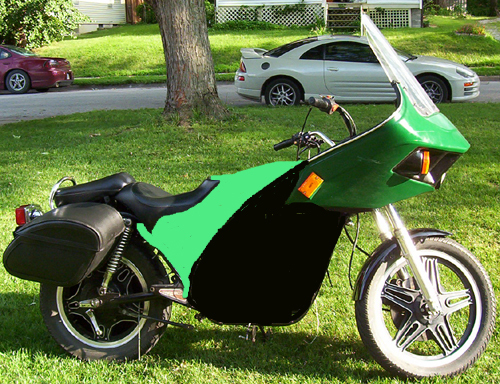 This is one of my designs for this bike. We was testing this bike at 36v now we stepped it up to 48v. Wow what a change! 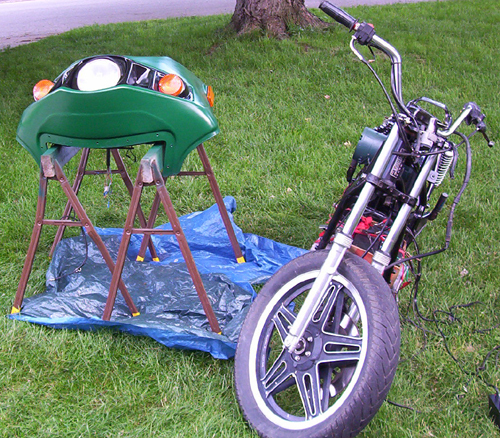 from 36 to 48v the bike burns rubber now. Now we are having so much fun riding this bike. 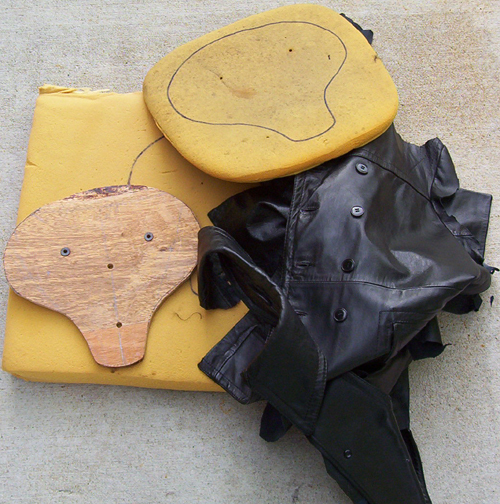 Thinking outside the box we took a old office chair,couch cushion, and a leather coat to make a custom seat. As you can see we are not using our homemade seat. I would like to thank the person I acquired the parts from. 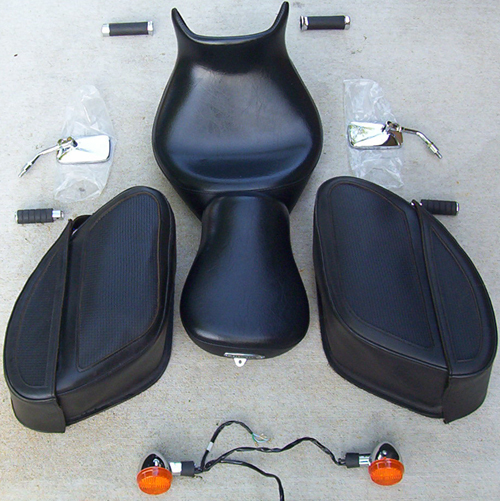 We installed the seats and saddle bags on the side of the bike. 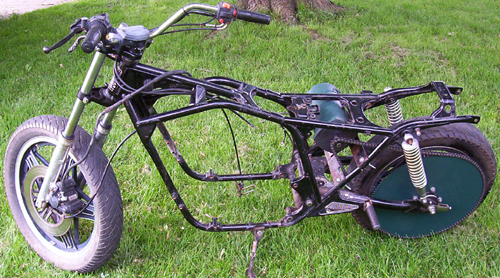 Our bike is starting to look like a motorcycle. We installed a front fender. We installing the electronics and doing the final wiring. The bike is almost ready for all to see. 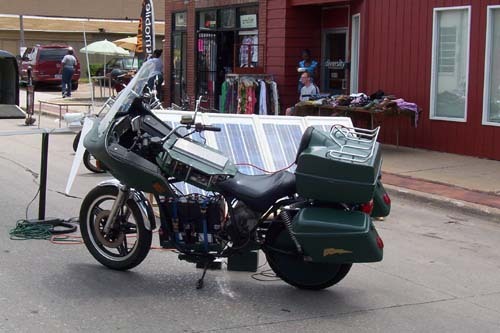 This bike can be charged on the grid,solar and wind. 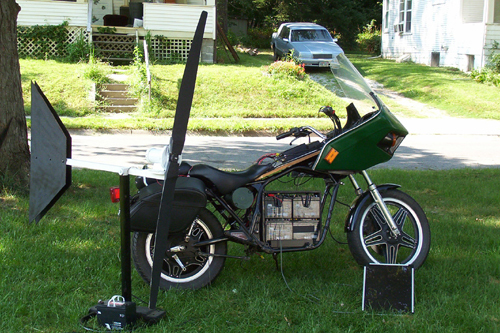 Our wind generator will charge the bike at 250 plus watts per hour. The red solar cell will only charge at 1.5 watts per hour. 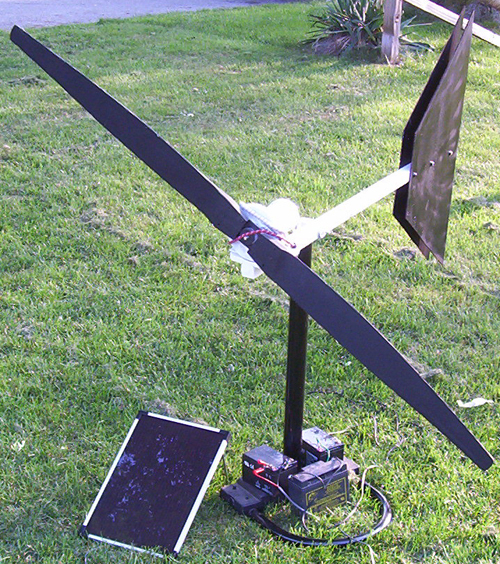 Ok after a ton of emails I am posting the wind generator. It is not ready yet but now you can look at it. We also are going to use 5 watt solar cells we need 16 of them. 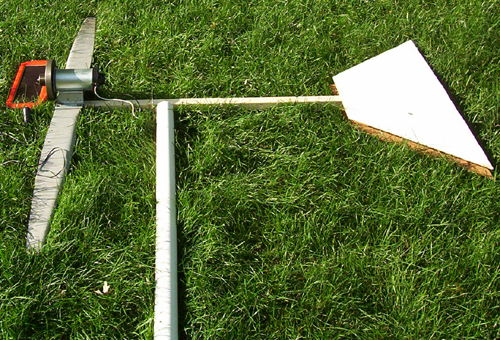 We completed the wind generator and painted it. I now have a small four foot mast to mount the generator on. 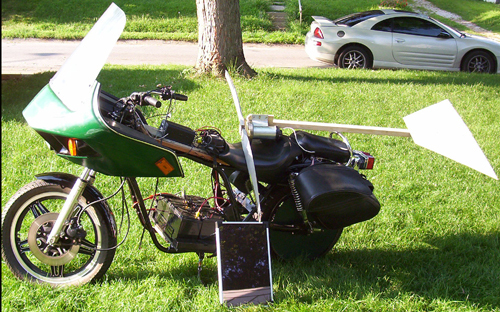 Here is the wind generator and solar cell panel for the electric motorcycle. 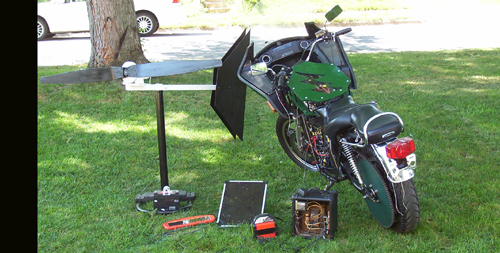 Our electric motorcycle is almost ready for the show. 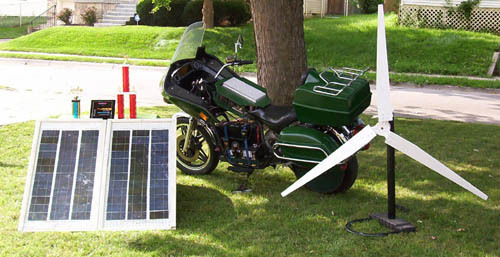 The wind generator and solar panel will be part of the bike display. 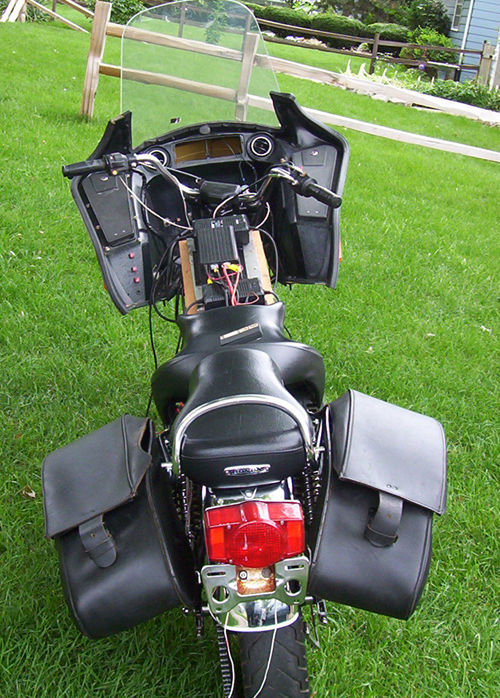 This is the cover over the electronics on the motorcycle. 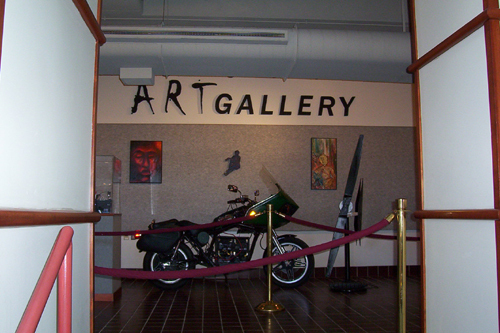 This is our Electric motorcycle on display in a art gallery. 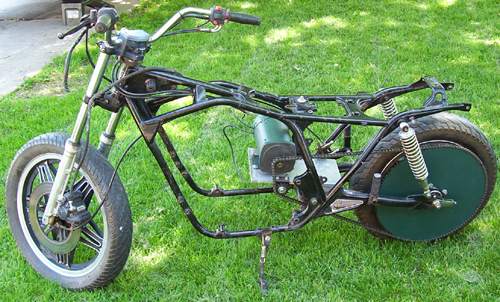 I made this electric motor cycle to use as a teaching tool. We must stop taking from this Earth and start giving back or we all lose. 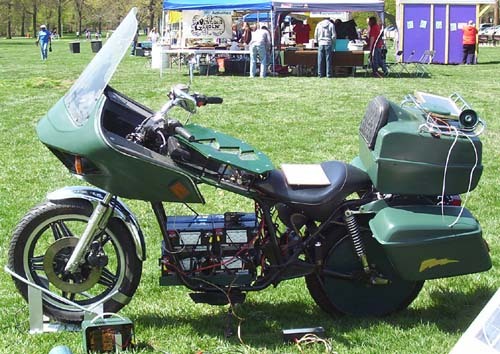 If this motorcycle sparks the mind of only one person young or old it was worth building this electric motorcycle. 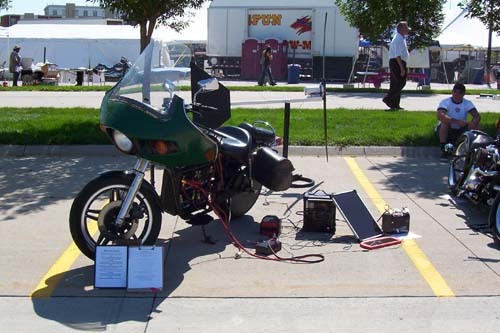 This is our electric motorcycle on display at the 2008 Motorcycle Show at Omaha's Septemberfest. 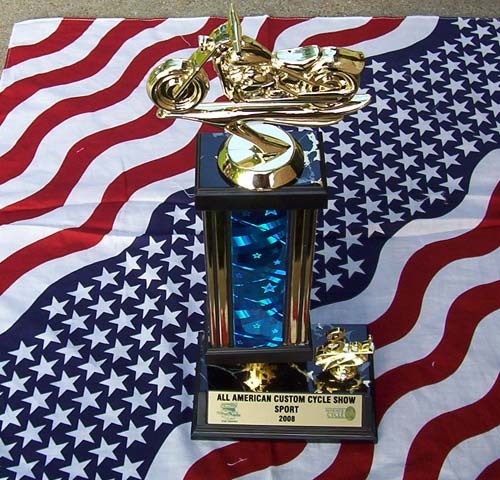 Electra green did get 3rd place in the custom sports category. She Has brought more hope to her owner and encouragement to others. Electra Green dressed up with better parts. Electra Green on a test run with new 55AH batteries. This is Electra Green on display April 17th 2010 at Earth Day Elmwood Park in Omaha, Nebraska. 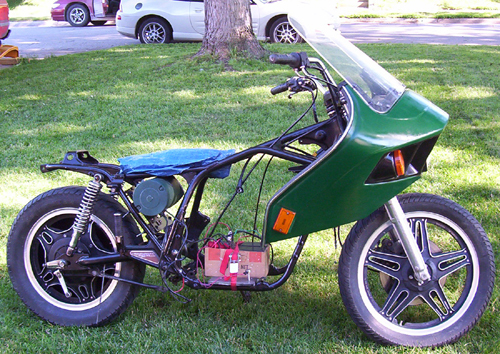 This is Electra Green on display June 12th 2010 at Benson Day in Omaha, Nebraska. It is all about gaving back to the community. 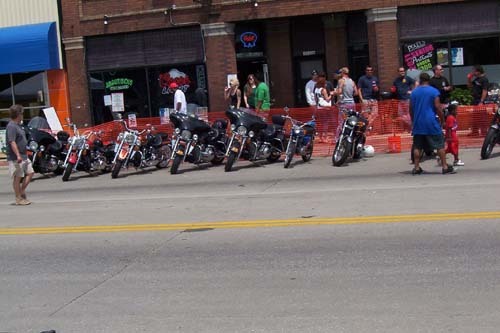 Many motorcycles on display June 12th 2010 at Benson Day in Omaha, Nebraska. 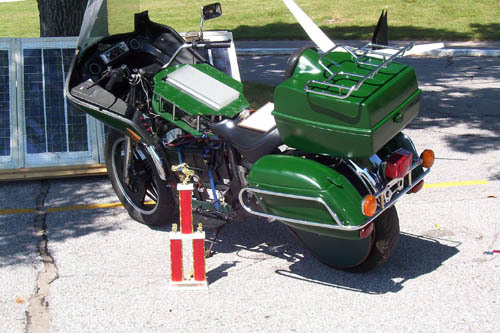 Electra Green took first place at the Liberty Christian Center Car and Motorcycle Show Aug 21, 2010 in Omaha, Nebraska. Electra Green took second place at the Warner Cycle Works (WCW) Car and Motorcycle Show Aug 28, 2010 in Omaha, Nebraska.